fastjet’s contorted strategies to develop a planned pan-South African LCC network continue to twist and turn, with the Tanzania-based carrier changing tack once again, this time shelving plans to launch domestic operations in South Africa in favour of commencing international services from Dar es Salaam. The London-listed carrier has been granted bilateral rights by Tanzania to operate international routes to South Africa, Zambia and Rwanda. fastjet had intended to launch twice daily domestic services on South Africa’s busiest domestic route between Johannesburg and Cape Town in early Jul-2013 as part of a joint venture with South African investment company FastJet Holdings (previously Blockbuster) and charter carrier Federal Air, which was to have operated the route with a wet-leased 737-300. In addition the carrier has entered into an MoU with Nigeria’s Red 1 Airways to expand the brand to West Africa, apparently under a new model in which local partners take a majority stake in the venture using the fastjet brand. Red 1 reportedly consists of a group of Nigerian investors interested in launching a new carrier in Western Africa. Bilateral rights from Tanzania to South Africa, Zambia and Rwanda are a major step in fastjet’s aspiration to establish a pan-African network which to date has struggled to expand beyond its original Tanzanian domestic operations. While its operations in Tanzania have been relatively successful, the market is too small to sustain the carrier without supporting international connections. Launch dates for services to Johannesburg, Kigali and Lusaka from Dar es Salaam are expected to be announced soon. fastjet’s growth has been inhibited by the lack of international routes and has limited the carrier to offering double daily domestic services between Dar es Salaam, Kilimanjaro and Mwanza. 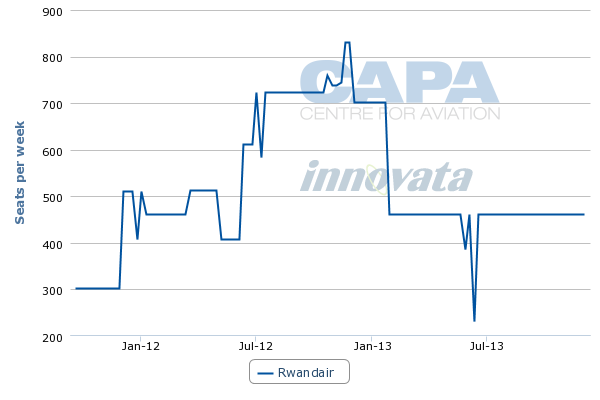 The airline suspended services from Kilimanjaro to Mwanza and Zanzibar in Apr-2013 due to low seasonal demand. The Kilimanjaro-Zanzibar route will recommence on 02-Jul-2013. The carrier claimed it had been promised that international rights from Tanzania would be granted soon after launching domestic services in the country in Nov-2012. However, the process had been slower than expected and it had taken intensive lobbying to finally gain approval. But fastjet’s decision to focus on launching international services from Tanzania will now come at the expense of the much vaunted planned domestic services in South Africa; these have been put on hold indefinitely. fastjet had planned to commence double daily Johannesburg-Cape Town services in early Jul-2013 as part of a joint venture with South African investment company Fastjet Holdings (formerly Blockbuster). fastjet announced an MoU with Blockbuster in Apr-2013 under which Blockbuster will own 75% of the new entity, allowing fastjet to comply with the minimum South African ownership required to operate domestic services and access international traffic rights. fastjet will hold the remaining 25%. fastjet will, however, provide the funding for the operation including GBP2 million (USD3.1 million) raised through the issue of 160 million new shares to an unidentified institutional investor. fastjet sees a strategic gap in the South African marketplace for a pan-continental, low-cost airline. As South Africa’s middle class grows, the demand for affordable air travel will increase and fastjet plans to tap into the growth. fastjet CEO and interim chairman Ed Winter stated: "Bringing the fastjet brand to South Africa is a cornerstone in the creation of our pan-African network. We remain totally committed to launching the fastjet brand in South Africa as soon as possible, but given all the time and effort the team has invested over the past months to secure our international route designations, we have taken the sensible decision to prioritize setting up these lucrative and high profile routes first, before turning our attention to launch the fastjet brand on domestic routes in South Africa". 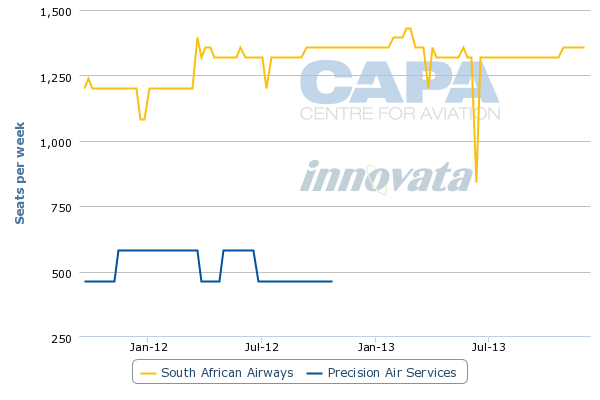 Incumbents, state-owned South African Airways and privately-owned Comair, believe the competitive South African market is already over-served. Both carriers also operate LCC subsidiaries Mango and Kulula respectively, which would compete with fastjet. South Africa has been a difficult market for LCCs in which to gain traction, with the demise of Velvet Sky and 1time in 2012 in the face of tough competition, high fuel costs and inefficient fleet. fastjet unsuccessfully attempted to buy the assets of 1time from its provisional liquidator as a means to quickly enter the market by the end of 2012 and gain access to 1time’s valuable international rights. fastjet is promising to reduce the cost of air travel between Johannesburg and Dar es Salaam by 60% with launch fares starting from USD100 (one way, excluding government taxes and charges). That compares to USD400 charged by SAA (including USD147 in taxes and charges) for the approximately 3h30m flight. 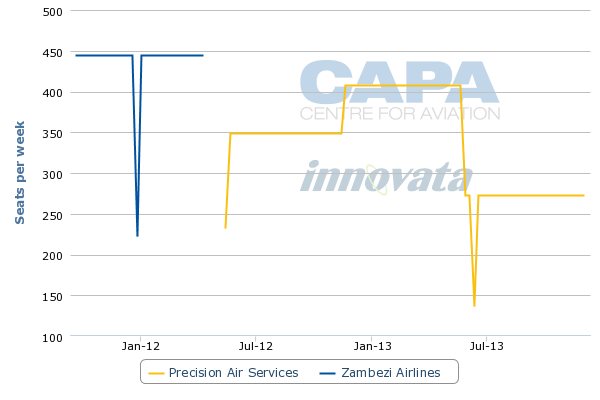 South African Airways (SAA) has enjoyed a monopoly on the route since Oct-2012 when Tanzanian carrier Precision suspended services to South Africa. SAA offers about 1,375 one-way seats per week on the route operating 11 passenger frequencies with A319 aircraft. In addition SAA operates a weekly 737-300 freight service on the route. SAA’s LCC subsidiary Mango also offers 186 one-way seats per week between Zanzibar and Johannesburg. Mango took over from 1time, which offered 462 seats per week before it collapsed in Nov-2012. fastjet states the Zambia service will benefit from good trade links between it and Tanzania. Zambia’s economy has experienced strong growth in recent years, with real GDP growth in 2005-2012 more than 6% per year, driven largely by record high copper prices from the nation’s mines and a bumper maize crop in 2010 which helped Zambia to rebound quickly from the global financial crisis. However, Zambia remains heavily reliant on international carriers to help develop the local travel and tourism industry and has signed open skies agreements with a number of countries in a bid to boost air transport links. National carrier Zambia Airways collapsed in 2009 and Zambezi Airlines suspended all operations in Oct-2012 due to liquidity issues. That has left Precision Air as the only airline operating services from Tanzania to Lusaka, offering a twice weekly one-way 737-300 frequency. Precision also operates a weekly service from Lubumbashi in the Democratic Republic of the Congo. fastjet’s entry on the Dar es Salaam-Kigali route could put pressure on RwandAir which is the sole operator on the route offering four times weekly frequencies. The national carrier also flies twice per week between Kigali and Kilimanjaro. Having met with constant political hurdles to establish operations outside of Tanzania, including in Kenya and South Africa, fastjet is turning to establish a pan-African network through joint ventures with local investors who will have a majority shareholding in the operation, but operate under the fastjet brand and standards. "fastjet is finding it is getting more progress on the ground with governments by working with local investors, plus there is less element of risk by taking a minority stake as well as meeting country criteria on foreign ownership," a company spokesperson was reported as saying. This local control model is also the basis of an MoU signed with aspiring Nigerian start-up Red 1 Airways which fastjet hopes to use as a vehicle to expand its presence in Western Africa. fastjet will be a minority shareholder in the joint venture which will be funded by Red 1 and will in turn operate under a service agreement from fastjet. Mr Winter said in a statement: "The combination of fastjet’s brand and experience and Red 1’s extensive knowledge of the local aviation market and Nigerian business landscape is a perfect foundation for a great airline." Red 1 Airways is reportedly a Nigerian commercial aviation business and airline holding company based in Abuja which aims to significantly increase the size of the Nigerian aviation market by making air travel affordable for people who currently travel on the country’s poor road system. The airline is reportedly in the process of obtaining an AOC. Red 1 CEO Dikko Nwachukwu stated the company had spent 10 years fine tuning the business plan and waiting for the right opportunity to meet the increasing demand for affordable air travel in Nigeria. “The time has now come to partner fastjet and seek to provide Nigeria with a world class low cost carrier,” he said. fastjet CCO Richard Bodin reportedly stated that Nigeria is the biggest market in Africa with the nation’s population of 165 million people accounting for about 20% of the continent’s population. As such, the under-developed market represented a large opportunity to fastjet. Red 1 may also be among four unidentified new airlines that the Nigerian Government was relying on to break the effective duopoly between Arik Air and Aero and reduce the cost of air travel in 2013. Both carriers are have been prevented from receiving further loans from Nigerian banks by the Central Bank of Nigeria due to the airlines' outstanding debts as part of state bailout packages to see them through the global financial crisis. In addition the government has announced plans to launch a new national carrier, to be called National One, effectively replacing Air Nigeria which collapsed in Sep-2012. However, no further details about the proposed carrier, including a launch date or routes it will target have been revealed. fastjet already owns Fly540 Ghana and Angola, but has struggled to gain approval to implement its brand in those markets. Meanwhile fastjet is also searching for a new chairman after David Lenigas abruptly resigned from the position in Jun-2013, “to concentrate on his other business ventures”. Mr Winters has been appointed as interim chairman while search is conducted for a permanent replacement. Mr Lenigas’ departure follows fastjet auditors KPMG qualifying the company’s financial accounts for the 18 months to 31-Dec-2012, as well as a takeover of fastjet parent company Lonrho by FS Africa, which controls 19.9% of Lonrho and represents a group of Swiss investors, who agreed in May-2013 to acquire Lonrho for GBP175 million (USD273 million). KPMG warned in its qualified opinion that there is “significant doubt” that the group could continue to trade as a going concern. The opinion was based on fastjet’s USD56 million net loss, the need for an improvement in trading, particularly through the launch of international services, and the need to raise additional funding. fastjet reported an operating loss of USD30 million for the period, with cash outflows of USD19.1 million. Faced with political hurdles that have prevented fastjet from entering markets outside of Tanzania, the carrier has fundamentally changed its business model from owning and operating airlines to taking a minority or, as in the case of the proposed Red 1 venture, no equity holding at all. Instead fastjet is turning to a model similar to franchising through service agreements which allow fastjet to control the brand using its distribution channels, as well as safety and operating standards. This model could see fastjet finally make the first steps to establishing bases in other African countries which will over time be linked to create the pan-African LCC network that the carrier set up to achieve. But meanwhile it will need to navigate the financial and leadership hurdles that have recently afflicted it.